Four bodies of Baloch missing persons shifted to Gwadar hospital after a fake encounter in Kulanch, Pasni. According to details on 2 Nov 2016 Pakistan army handed over four dead bodies to administrator of District Head Quarter (DHQ) Hospital Gwadar. All of the four dead bodies were later identified from ID card, Student Card and chits with their names found in their pockets. One of the victims was identified as 14-year-old Zafar Baloch S/O Master Abdul Rahman, a student of Govt. Boys High School, Gwadar Jadeed. He was arrested on 23 September 2016 from Colony, Gwadar and enforced disappeared by the Pakistan army. The second victim was identified as Sajid Ali S/O Kareem Bakhsh; resident of Ward number 4, Pasni. He was arrested on 31 January 2013 from his house in a raid at night and enforced disappeared by the Pakistan army. The third victim was identified as Sabir Ali S/O Mohammed resident of Ambi Kulanch Tehsil Pasni. He was arrested on 4 August 2014 and then enforced disappeared by Pakistan army from his home. 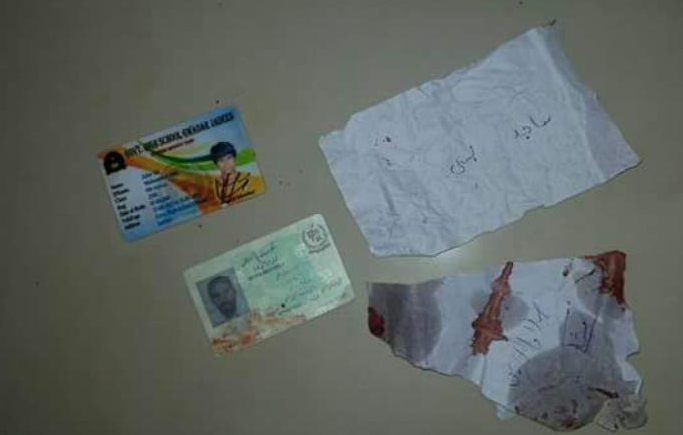 The fourth victim was identified as Salahuddin S/O Abdul Samad resident of Mashkay. He was enforced disappeared from Quetta on 23 March 2013. He was a member of the Baloch Students Organization-Azad (BSO-Azad). After transferring all the four dead bodies to DHQ Hospital Gwadar Pakistan army issued a press release to the local Journalists stating that a joint operation by Pakistan army and FC was conducted in Belaar Kulanch and Sardasht Kulanch areas in which four militants were killed and one was arrested. It is worth mentioning here that killing of enforced disappeared Baloch activists in fake encounter has become the creed of Pakistan army. More then30 thousand Baloch activists lay in Pakistani states torture cells; when the Pakistan army, the Frontier Corps (FC) and Intelligence agencies conduct military operation they kill and dump bodies of enforced disappeared activists and claim to media that they have killed Baloch militants. The Pakistani media or the Judiciary has never questioned the army as to why the arrested Baloch activists are not presented in the Pakistani courts and that those they present as killed militants have already been registered as enforced disappeared persons. All state institutions connive with the Pakistani army in perpetrating an organized and systematic ‘dirty war’ against the Baloch Nation.